NY PRICING AT THE EXACT SAME TIME. $1287.65??? As I have mentioned we are in options expiry week and you should expect pressure on gold/silver for the next 7 trading days. Gold and silver got a break today as Trump demanded his wall. If he does not get the secured funding for the wall, he will shut down government as there will not be a signed budget agreement for 2018. The USA has only 86 billion dollars left in the kitty and they burn around 3 billion per day. So they may run out by Sept 22 or Sept 23. Should be a very interesting September. RESULT: A SLIGHTLY LOWER OI WITH A LOWER PRICE. In ounces, the OI is still represented by just UNDER 1 BILLION oz i.e. 0.936 BILLION TO BE EXACT or 134% of annual global silver production (ex Russia & ex China). In gold, the open interest FELL BY A CONSIDERABLE 5,386 CONTRACTS WITH THE FALL in price of gold ($5.20 LOSS YESTERDAY .). The new OI for the gold complex rests at 500,443. THE BANKERS INITIATED A RAID YESTERDAY AS THEY INITIALLY SUPPLIED THE SHORT PAPER TO LOWER THE GOLD PRICE. SOME OF OUR NEWBIE SPECS EXITED THE GOLD ARENA AND THE BANKERS COVERED A TINY PORTION OF THEIR SHORTS. Result: A LOSS IN OI with LOSS IN PRICE IN GOLD. IN THE LAST 28 TRADING DAYS: GLD SHEDS 37.68 TONNES YET GOLD IS HIGHER BY $56.50 . 1. Today, we had the open interest in silver FALL BY 1400 contracts from 188,627 DOWN TO 187,227 (AND now A LITTLE FURTHER FROM THE NEW COMEX RECORD SET ON FRIDAY/APRIL 21/2017 AT 234,787) DESPITE YESTERDAY’S 3 CENT LOSS IN TRADING. SILVER REMAINED QUITE RESILIENT AND REFUSED TO LOWER IN PRICE DESPITE THE RAID INITIATED BY THE CROOKS. SOME NEWBIE LONGS EXITED THE ARENA BUT NOT MUCH. THE BANKERS STILL REFUSE TO SUPPLY THE NECESSARY SHORT PAPER! RESULT: SLIGHTLY LOWER OI WITH A TINY LOWER PRICE. Seems Kim is not stopping in his pursuit of nuclear weapons. In this latest photo, Kim is inspecting new missiles. The Provident subprime mess that I reported to you on yesterday. Egypt snubs Kushner as they cancel a meeting with him after Trump “delays” $300 million aid pkg that Obama initiated when in office. Will this sever relations with the USA and will Egypt seek other allies destabilizing the middle east..
iv)This is interesting: will Estonia be the first country to issue its own digital currency? v)Back in December 2016, I highlighted the fact that 300 tonnes of gold stored at the FRBNY was shipped to Frankfurt and that the only thing that remained was 91 tonnes of gold stored in Paris. Today the Bundesbank announced that all 374 tonnes asked for has been sent to Frankfurt which now has 50.6% of its gold stored domestically. The big question is why the hurry to complete the repatriation 3 yrs early? i a)Soft data reporting of USA services soars to highest levels since 2015. However soft data manufacturing slumps. pay no attention to this data. i c)The following shows the huge rut the uSA is in with respect to their economy. New home sales plunged by a monstrous 9.9% last month. This follows June’s huge plunge in new household formations as millennials continue to live with their parents. iii)The market certainly does not like this: bad blood is spilling between Trump and McConnell as their relationship disintegrates. McConnell doubts whether Trump can save the Presidency . iv)Very strange: former USA Attorney states that there is something every odd in the indictment on the Awan. The total gold comex open interest FELL BY CONSIDERABLE 5,386 CONTRACTS DOWN to an OI level of 500,443 WITH THE GOOD SIZED FALL IN THE PRICE OF GOLD ($5.20 with YESTERDAY’S trading).This time the bankers did supply the necessary gold short paper to initiate the raid. Newbie longs got caught up in this continued shenanigans and were forced out probably through stop losses. The bankers relied on ASSISTANCE from their HFT friends which helped the bankers cover a tiny portion of their shortfall. Result: lower open interest and a bigger fall in the price of gold. The active August contract LOST 93 contract(s) to stand at 739 contracts. We had 0 notices filed on YESTERDAY so we LOST 93 contracts or an additional 9300 oz will NOT stand at the comex and 93 EFP’s were issued which entitles the long holder to a fiat bonus plus a futures contract and most probably that would be a London based forward. The non active September contract month saw it’s OI LOSE 49 contracts DOWN to 1315. The next active contract month is Oct and here we saw a LOSS of 10 contracts DOWN to 52,180. The very big active December contract month saw it’s OI LOSE 5394 contracts DOWN to 390,087. And now for the wild silver comex results. Total silver OI FELL BY SMALLER THAN EXPECTED 1400 CONTRACTS FROM 188,627 TO 187,227 DESPITE YESTERDAY’S 3 CENT LOSS IN PRICE (AND RAID). THE BANKERS AGAIN WERE RELUCTANT TO ADD TO THEIR SHORTFALL DESPITE THE RAID INITIATED BY THE CROOKS. WE LOST A FEW NEWBIE SPEC LONGS WHO GOT CAUGHT UP IN THE RAID. RESULT: SLIGHT LOSS IN OI AND A LOSS IN PRICE. We are now in the next big non active silver contract month of August and here the OI GAINED 1 contract UP TO 24. We had 14 notice(s) filed yesterday. Thus we GAINED ANOTHER 15 contract(s) or an additional 75,000 oz will stand for delivery in this non active month of August and AGAIN zero EFP’s were issued for the August contract month. Please note that in gold we continually see EFP’s issued but not in silver!! The next active contract month is September (and the last active month until December) saw it’s OI fall by 5008 contacts down to 75,306. The next non active contract month for silver after September is October and here the OI gained 10 contacts up TO 488. After October, the big active contract month is December and here the OI GAINED by 3518 contracts UP to 98,664 contracts. Today, 0 notice(s) were issued from JPMorgan dealer account and 0 notices were issued from their client or customer account. The total of all issuance by all participants equates to 3 contract(s) of which 0 notices were stopped (received) by j.P. Morgan dealer and 0 notice(s) was (were) stopped/ Received) by j.P.Morgan customer account. To calculate the initial total number of gold ounces standing for the AUGUST. contract month, we take the total number of notices filed so far for the month (4584) x 100 oz or 458,400 oz, to which we add the difference between the open interest for the front month of AUGUST (739 contracts) minus the number of notices served upon today (3) x 100 oz per contract equals 532,300 oz, the number of ounces standing in this active month of AUGUST. Thus the INITIAL standings for silver for the AUGUST contract month: 1104 (notices served so far)x 5000 oz + OI for front month of AUGUST(24 ) -number of notices served upon today (15)x 5000 oz equals 5,565,000 oz of silver standing for the AUGUST contract month. This is extremely high for a non active delivery month. Silver is being constantly demanded at the silver comex and we witness again the amount of silver increases daily right from the get go. We GAINED ANOTHER 15 contracts or an additional 75,000 oz wishes to stand for delivery in this non active month of August and 0 EFP’s were issued for the silver August month. At this point in the delivery cycle last year on August 23/2016 we had 68,374 contracts standing vs this yr at 75,306. FRIDAY’S CONFIRMED VOLUME OF 106,944 CONTRACTS WHICH EQUATES TO 534 MILLION OZ OF SILVER OR 76% OF ANNUAL GLOBAL PRODUCTION OF SILVER EX CHINA EX RUSSIA). IN OUR HEARINGS THE COMMISSIONERS STRESSED THAT THE OPEN INTEREST SHOULD BE AROUND 3% OF THE MARKET. 1. Central Fund of Canada: traded at Negative 6.5 percent to NAV usa funds and Negative 6.8% to NAV for Cdn funds!!!! Note: Sprott silver trust back into NEGATIVE territory at -0.57%/Sprott physical gold trust is back into NEGATIVE/ territory at -0.27%/Central fund of Canada’s is still in jail but being rescued by Sprott. *LAST 157 TRADING DAYS: A NET 6.84 TONNES HAVE NOW BEEN ADDED INTO GLD INVENTORY. It has been ten years since the global financial crisis began to take hold. At the time few would have known that BNP Paribas’ decision to freeze three hedge funds was the signal for the deepest recession in living memory and a near-collapse of the financial system. As the French bank blamed a “complete evaporation of liquidity” on its decision the ECB flooded its the market with billions of euros of emergency cash as it worked to prevent a seizure in the financial system. Very few realised how much the financial and investment landscape was set to change. In the proceeding decade we have seen unprecedented intervention by central banks which in turn has created a punishing financial landscape for savers and investors. For those who were unfortunate to experience bank bailouts first hand or a collapse in a housing market, an instant lesson was learnt about the importance of protecting your savings. That would have been a savvy lesson to learn. Any investors feeling the ripples of the financial crisis and looking to protect their wealth may well have looked to gold as an option. By adding gold to their portfolio they would currently be looking at some extremely healthy returns. For those who were slower on the uptake of portfolio protection, they still would have benefited from gold’s decade climb and its performance alongside other major asset classes. 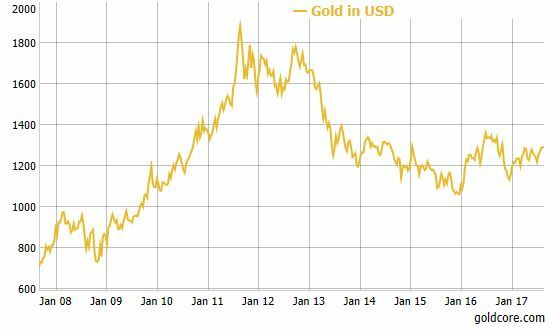 Gold continues to be dismissed by the mainstream as an important asset-class for investors. However the decade long-climb for the precious metal is example enough of it’s strong performance against a backdrop of financial and political turmoil. The yellow metal has outperformed a number of key assets and is up at least 100% in major currencies. Gold priced in sterling, euro and (US) dollar is up by at least 100%. Gold in a sterling a whopping 200%. In contrast many major asset classes have not performed to the same extent, or met expectations. For example, MSCI’s main world equity index might currently be on course for its longest monthly winning streak since 2003, but this is only 22% above levels in 2007. Plus, as central banks actively stockpiled bonds, yields on 10-year government debt benchmarks have more than halved. In the decade since the financial crisis gold has been one of the top performing assets. 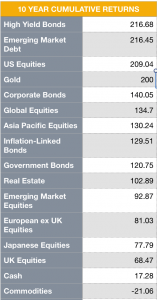 The table below shows the best performing asset classes in the last ten years. It is clear to see that gold (when priced in sterling) has outperformed the majority of bonds and many equities (when priced in dollar and euro). The precious metal has held its own throughout a decade of financial confusion and distress. This should come as no surprise to gold investors who are aware of gold’s ability to act as a long-term safe haven during times of crisis. What is most interesting about the last ten years however is that the mainstream media and politicians are keen to promote the idea that the crisis is over. Yet, in many instances the situation is the same or, arguably, worse. The financial environment is still an unattractive one for the average investor and saver. A huge amount of leverage remains in the system, stocks are at unsustainable highs and geopolitical risks grow by the day. 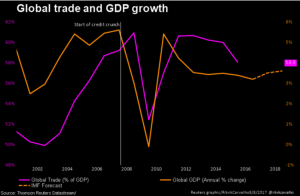 It is clear to see that the global recovery is not the win that so many governments wish us to believe. For many savers, the idea of investing in markets following the financial crisis may have seemed too risky. Instead they may have opted to hold cash than they would have previously. In times of crisis many argue that cash is king. This has certainly been evident in the short-term. However those who decided to hold cash over the last decade, as a form of insurance, will be hurting today. A saver putting away £5,000 each year into the average UK savings account over the last decade would have only seen their savings grow by a stomach-churning 1.2% to £50,619. Cash has been significantly devalued thanks to ongoing monetary easing programs by central banks. Savers have also lost out massively due to record low interest rates. Low interest rates have been good news for borrowers. Rates have been low for so long that we are now faced with a generation of borrowers who have never experienced an interest rate rise. 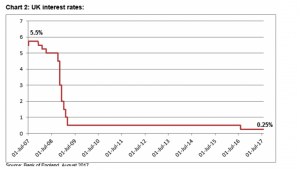 For the UK we have not see interest rates above 5.5% for over ten years. This is great for those looking to get on the housing ladder or borrow for university but this will not be the norm. Savers who have already been pushed through low rates may soon see further punishment once rates begin to rise and borrowers can no longer service their debts. How banks will cope is a question few people are able to answer. Low interest rates are not the only impact from the financial crisis on cash savers. Negative rates are the true issue along with bank bail-ins of which few people are aware. 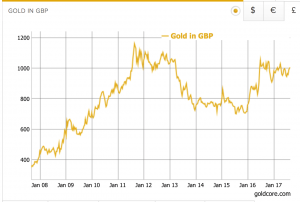 To see more on how well gold has performed next to cash, see our recent coverage. Gold has stood strong and held its own in the face of pumped up asset classes, low interest rates and increased risk. This is largely thanks to its sovereignty in the marketplace. It is a myth that the worst of the financial crisis is over. The trigger to the collapse may well be different to that which took place a decade ago but the situation is very similar. Gold’s long-term rise and strong performance is not over as sadly the financial and geopolitical crises are still ongoing. But mainstream financial news organizations miss their best chance yet to ask critical questions about the government’s surreptitious activity in the gold market. LOUISVILLE, Kentucky — Inside the famed vaults at Fort Knox, Senate Majority Leader Mitch McConnell held a 27-pound gold bar in his hands today as part of the first civilian delegation to see most of the country’s bullion reserves in more than 40 years. McConnell was part of a delegation of Kentucky politicians allowed inside the United States Bullion Depository at Fort Knox for the first time since 1974. U.S. Treasury Secretary Steven Mnuchin initiated the visit, along with U.S. Rep. Brett Guthrie and Gov. Matt Bevin.The depository holds more than 147 million ounces of gold, which puts its market value at more than $186 billion. While primarily known as a vault for gold, the depository also held the Declaration of Independence and the U.S. Constitution during World War II. Mnuchin said it was the first time Fort Knox opened its vaults to outsiders since a Congressional delegation and some journalists were let in to view the gold for the first time in 1974. McConnell said he had never thought about visiting Fort Knox before, but jumped at the chance when Mnuchin offered to take him. In an interview, McConnell said he could not say much about the visit for security reasons. But Bevin, speaking on WHAS radio, divulged a few more details. He said it took “quite a bit of time” to get in and out of the facility, and said officials had to cut a seal to open the vault for them. U.S. Treasury Secretary Steven Mnuchin paid a rare official visit Monday to Fort Knox to check out the nation’s gold stash — while keeping an open mind for future film projects. “I assume the gold is still there,” the former Hollywood producer quipped to an audience in Louisville, Kentucky, 40 miles north of the U.S. Bullion Depository. “It would really be quite a movie if we walked in and there was no gold.” After the visit, he playfully reassured Americans the treasure was still secure. .Fort Knox has been seared into the public imagination since the 1964 James Bond movie “Goldfinger,” in which the British spy, played by Sean Connery, foiled a plot to contaminate the nation’s bullion. Mnuchin, whose action-film credits include “Mad Max: Fury Road,” “The Lego Batman Movie,” and “Suicide Squad,” said that he would be only the third secretary of the Treasury to go inside the vault since it was created in 1936 by President Franklin Delano Roosevelt. This is interesting: will Estonia be the first country to issue its own digital currency? “Ethereum founder Vitalik Buterin has a keen interest in Estonia’s development as a digital nation and has provided valuable feedback for the estcoin proposal. Back in December 2016, I highlighted the fact that 300 tonnes of gold stored at the FRBNY was shipped to Frankfurt and that the only thing that remained was 91 tonnes of gold stored in Paris. Today the Bundesbank announced that all 374 tonnes asked for has been sent to Frankfurt which now has 50.6% of its gold stored domestically. The big question is why the hurry to complete the repatriation 3 yrs early? … the real reasons, however, is that following several reports on this website which cast doubts on Germany’s gold holdings, in late 2012 the German Court of Auditors demanded that the Bundesbank undertake an audit of its gold reserves. Specifically, the court wanted to ensure that the nearly 3400 tons of gold, of which more than 2,000 tonnes held offshore, is in fact in existence – ‘because stocks have never been checked for authenticity and weight‘. The move to repatriate was only accelerate following rumors that much of the offshore-held gold might have been “rehypothecated”, and not be there anymore, that it might have been melted down, leased, or sold. As a result, following blowback from both the media and the public, the Bundesbank accelerated its activity, and repatriated 120 tonnes in 2014, 210 in 2015, and another 216 in 2016, implying that the Bundesbank’s faith in its foreign central bank peers had declined in inverse proportion to the accelerating redemption schedule. Finally, Germany’s push to redomicile its gold also prompted a similar partial gold repatriation by the Netherlands. The Bundesbank has completed its gold transfer process earlier than originally planned. After the gold in New York was able to be transferred ahead of schedule in 2016, roughly 91 tonnes of gold still remained in Paris. This was relocated to Frankfurt this year and as a result, there are no longer any German gold reserves in Paris. “This closes out the entire gold storage plan – around three years ahead of the time we were aiming for,” reported Carl-Ludwig Thiele, Member of the Bundesbank’s Executive Board, referring to the gold storage plan unveiled in 2013. This plan saw the Bundesbank storing half of Germany’s gold reserves in its own vaults in Frankfurt am Main from 2020 onwards, requiring the phased transfer of approximately 300 tonnes of gold from New York and about 374 tonnes of gold from Paris. And so, Germany’s repatriation of 674 tonnes of gold – or 53,780 bars of gold – is complete, lifting the amount of gold held domestically to 1,710 tonnes or 50.6% of the total. Going forward, Germany will still have 1,236 tonnes held at the NY Fed, and another 432 tonnes of gold at the Bank of England. Why this unexpected scramble to repatriate $28 billion in physical gold 3 years ahead of the stated schedule, remains a “mystery. 3b Japan 10 year bond yield: FALLS TO +.038%/ GOVERNMENT INTERVENTION !!!! (Japan buying 100% of bond issuance)/Japanese yen vs usa cross now at 114.34/ THIS IS TROUBLESOME AS BANK OF JAPAN IS RUNNING OUT OF BONDS TO BUY./JAPAN 10 YR YIELD FINALLY IN THE POSITIVE/BANK OF JAPAN LOSING CONTROL OF THEIR YIELD CURVE AS THEY PURCHASE ALL BONDS TO GET TO ZERO RATE!! 3j Greek 10 year bond yield FALLS to : 5.578??? 30 SNB (Swiss National Bank) still intervening again in the markets driving down the SF. It is not working: USA/SF this morning 0.9678 as the Swiss Franc is still rising against most currencies. Euro vs SF is 1.1411 well above the floor set by the Swiss Finance Minister. Thomas Jordan, chief of the Swiss National Bank continues to purchase euros trying to lower value of the Swiss Franc. Yesterday, when stocks surged at the market open following Politico’s report that Trump is unexpectedly “making strides” on tax reform, we warned that “it can all be wiped away as soon as tonight, when Trump will deliver a speech to his “base”, in which he may promptly burn any of the goodwill he created with capital markets following his far more conventional Afghanistan speech last night.”Well, that’s precisely what happened, because on Tuesday night, in another fiery campaign rally, Trump fiercely defended his response to violence in Charlottesville, made passing remarks from a teleprompter about the need for unity and inclusion before veering off-script to attack the news media, Democrats and even Republicans in the Senate whom he accused of distorting his response and blocking his agenda. But what spooked markets, and what has sent both US futures and European stocks lower, was Trump’s threat to bring the U.S. government to the brink of a shutdown if needed to pressure Congress into funding the border wall that was a centerpiece of his 2016 campaign, stoking renewed fears that the debt ceiling debate will be far more contentious that the market expects. Delivering a warning to Democratic lawmakers who have objected to his plans to construct a wall along the U.S.-Mexico frontier, Trump called them “obstructionists” and said that it was time for the U.S. to crack down on illegal immigration. “If we have to close down our government, we’re building that wall,” Trump told thousands of supporters gathered in Phoenix for a campaign-style rally. “One way or the other, we’re going to get that wall.” As Trump spoke, S&P500 futures reversed gains to slip as much as 0.3% as Trump spoke. As Bloomberg notes, Trump has asked for $1.6 billion to begin construction of the wall, with Congress under pressure to pass some kind of spending bill to keep the government open after Sept. 30. But Republicans in Congress haven’t shown much appetite for fighting to spend potentially billions more on a border barrier either. The funding would add to the deficit at the same time Republicans are trying to figure out how to pay for tax cuts. “His comments on the NAFTA negotiations once again brings the general direction toward obstructing free trade, and raises concerns over its impact on global trade,” said Hideyuki Ishiguro, a senior strategist at Daiwa Securities Co. in Tokyo. Still, despite the latest Trump bluster, the hope for tax reform wasn’t completely killed: during his speech Trump repeated his call for a historic tax cut, promising to pass the “first major tax reform in over 30 years.” While he provided no details of any planned legislation, he urged congressional Democrats to support it. Democratic senators in states he won should be particularly wary, Trump said. Most Senate Democrats have said they’ll refuse to support any tax legislation that provides a tax cut to the highest earners. “The Democrats are going to find a way to obstruct,” Trump said. If so, he told his supporters, they’ll be preventing Americans from receiving a “massive tax cut.” Unlike healthcare, tax reform is a less divisive issue among Republicans and could represent Trump’s first major legislative victory, if it were to pass, although in light of recent reports of a collapse in relations between Trump and Mitch McConnell, even that now looks improbable. Putting it all together, on Wednesday morning S&P futures are down 0.24%, alongside with European shares and oil. The Yen gained versus all G-10 peers as investors sought safer assets afterTrump threatened to bring the U.S. government to the brink of a shutdown if needed to pressure Congress into funding the border wall that was a centerpiece of his 2016 campaign, and threatened to terminate Nafta at some point. The euro was the standout gainer in an otherwise listless day in markets, as strong European data boosted confidence in the region’s growth, while a speech by Mario Draghi, seen as a preview to his Jackson Hole address, did not unveil any new dovish message/policy shift, and instead underscored the recent European strength. Gold and yen benefited as comments from President Donald Trump provoked another bout of investor caution. The surprise gain in the European PMI index, however, did little to spur the Stoxx Euro 600 Index, which retreated led by WPP Plc after the world’s largest advertising company cut its revenue forecast. Despite the strong survey data, European stocks traded lower across the board, with the Stoxx Europe 600 Index down 0.2% in early trading. The U.K.’s FTSE 100 Index gained less than 0.05%, while Germany’s DAX Index fell 0.1 percent. Meanwhile, geopolitical events continue to escalate in the background: Trump also said that North Korean leader Kim Jong Un is beginning to respect the U.S., the latest comments that suggest his administration is moving closer to seeking talks over Pyongyang’s nuclear arsenal. But the U.S. tightened its financial restrictions on North Korea, slapping sanctions on Chinese and Russian entities it accused of assisting Pyongyang’s development of nuclear weapons and ballistic missiles. Economic data include MBA mortgage applications, PMIs and new home sales. RBC, Lowe’s, HP and Eaton Vance are among companies reporting earnings. Asian equity markets traded mixed as the region somewhat failed to sustain the impetus from Wall St, where the Nasdaq led the surge after rebounding from a 3-day losing streak. ASX 200 (-0.23%) and Nikkei 225 (+0.26%) were both initially higher with outperformance in the Japanese bourse due to early JPY weakness. However, majority of gains were later pared amid comments from President Trump regarding shutting down the government to build the wall, while ASX 200 slipped into the red as losses in Healthscope and IAG post-earnings dampened healthcare and financials. Shanghai Comp. (-0.08%) traded choppy despite a firmer liquidity injection by the PBoC of CNY 180bln via reverse repos, as this still amounted to a daily net drain once maturing repos were taken into account, while Hang Seng remained closed due to Typhoon Hato. On a broad basis EU Bourses are trade with little in the way of firm direction, (Eurostoxx50 flat) following President Trump’s stormy speech in which he stated he would shut down Government in order to build a wall in-between USA and Mexico, while also commenting he could get rid of NAFTA. In stock specific news WPP shares are on course for its worst trading session in 19 years, falling 10% after the company cut its year outlook. Bund yield ticking higher this morning following the aforementioned better than expected German PMI readings, while slight outperformance has been seen in the short run end of the curve. Peripheral debt continues to underperform its German counterpart with Italian spreads wider by 3.9 bps. This morning has also seen the absorption of UK and GE supply which was relatively well received. In currenciues, there were no fireworks from Draghi at the Lindau meeting as the President does not address future policy or economic outlook in his speech. EUR edging higher this morning amid firm PMI readings from the Eurozone’s two largest economies, Germany and France. GBP slightly lower today, although much of the focus is on the GBP TWI, which is now at a fresh 2017 low at 74.90. Subsequently, suggesting that the outlook for import prices could be back on the rise. Today will set to soften its stance today on new legal laws, requesting to only end ‘direct jurisdiction’ of the ECJ after Brexit. NZD is the worst performer, slipping by 0.8% after the NZ governments pre-election fiscal update, in which they cut their GDP forecast, while cross related buying seen through AUD/NZD had also kept NZD pressured as the cross breached 1.09. MXN notably softer this morning following comments from President Trump who stated that the US would probably scrap NAFTA at some point (Mexico are to hold 2nd round of talks in September). Additionally, Trump also promised a government shutdown in order to build Mexico border wall, subsequently pushing USD/MXN higher by 0.5%. In commodities, WTI & Brent crude futures are marginally lower this mornings, despite the headline drawdown in the API Crude report, however there had been a sizeable build in Gasoline and Distillate inventories. Gold prices tracking higher by around 0.1% given the slight softness observed in equity markets. Looking at the day ahead, the Markit PMIs on manufacturing, services and composite are out for Eurozone, Germany and France, with stronger mfg numbers offset by weaker service data. In the US, there is the MBA mortgage applications and new home sales data (0% mom expected) for July. Onto other events, Draghi will speak at Lindau (Germany), potentially providing an update on the QE. The Fed’s Kaplan will also speak. Welcome to Jackson Hole Eve. As we said earlier this week, expectations have been dialled down a bit through August as to how hawkish central banks can afford to be at this juncture. Yes the Fed may hike in December and yes the ECB may announce a further taper for 2018 in October but recent events (softer inflation, softer market sentiment and the strong Euro for the ECB) may mean that now might not be the time they choose to guide markets towards such an outcome. On balance I think the risks are more skewed towards higher yields post the symposium as an increasing amount of investors have relaxed over the likely central bank message. We’ll see. Before we get to the main event, today sees the important flash PMI numbers and Mr Draghi will be the keynote speaker at the Lindau symposium in Germany at 9:25am CET. He is expected to speak about the “interaction between research and monetary policy decision making”. All before checking in to his transatlantic flight to the US. Ahead of Mr Draghi’s double bill, the flash PMIs today in the Euro area and for Germany and France will make interesting reading. Growth has been very robust on these measures but there has been some signs over the last couple of months that we’ve peaked out for now. For example, focusing on the composite index, current expectations are running a bit lower than their recent peak, with Germany at 54.7 (vs. 57.3 recent peak), the Eurozone (55.5 vs 56.8) and in France (55.4 vs 57.6). The strong Euro of late might cement that trend and it was interesting that yesterday’s German ZEW survey, whilst strong in terms of current economic conditions (best reading since Jan 2008), saw expectations falling to 10, which is the lowest level since October. This morning in Asia, Japan’s preliminary Nikkei manufacturing PMI for August was released at 52.8 (vs. 52.1 previous). After initially following the risk on from yesterday, bourses in the region are slipping after Mr Trump has been discussing ending NAFTA and also shutting down the government if he can’t get funding for his Mexican border wall. Another dimension to think about as we get closer to the budget ceiling stand off over the next couple of months. So markets are off their highs for the session but have still broadly followed the positive lead from US, with the Nikkei (+0.33%), Kospi (flat), but the ASX 200 dipped 0.25% while the Hang Seng was closed for the morning due to a typhoon. US equity markets had a stronger day as it was a good day in terms of political newsflow with regards to Mr Trump gaining momentum on his tax reform agenda. The Politico reporting that Trump’s top aides and congressional lawmakers have found common ground on some of the ways to pay for personal and corporate tax cuts. Some of the funding options touted include: capping mortgage interest deduction for home owners, scrapping state and local tax deductions, eliminate businesses’ ability to deduct interest while allowing the phase-in of full expensing for small businesses. The corporate tax rate is expected to fall to 22%-25%, but unlikely to be less than 20%. On the back of this, US equities strengthened, albeit on light volume. The S&P was up +0.99%, the Dow up +0.90% and the Nasdaq increased +1.36%. Within the S&P, only the real estate sector was in the red. Notable gains elsewhere included: IT (+1.45%), materials (+1.20%) and health care (+1.17%). European markets also increased, with the Stoxx 600 up 0.83% and all sectors increased. Elsewhere, the Dax (+1.35%), FTSE 100 and CAC (both up c0.9%) were higher, but Italy’s FTSE MIB dipped 0.11%. The VIX fell 14% to 11.5. 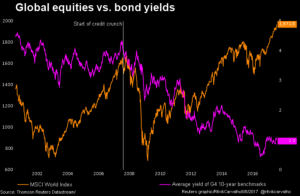 Over in the bond markets, yields modestly increased in the US and Europe. The UST 10Y yields were up 3bps (2Y: +2bps; 10Y: +3bps), while bunds were flattish (2Y: -0.4bp; 10Y: unch) and Gilts (2Y: -1bp; 10Y: +1.5bps) and French OATs (2Y: -0.5bp; 10Y: +0.5bp) up slightly at the longer end of the curve. The Italian BTPs had more action, with the curve sharply steeper (2Y: +2bps; 10Y: +7bps). A potential catalyst may have been reports that former PM Berlusconi who leads the centre-right Forza Italia party, has indicated his support for the introduction of a parallel currency in Italy. The idea itself is not new, but does highlight concerns about broader anti-euro sentiment in Italy, as the country heads into elections next year. Turning to currencies, the US dollar index strengthened 0.5% overnight. Conversely, the Euro/USD and Sterling/USD fell 0.5% and 0.6% respectively, while the Euro/Sterling was little changed. In commodities, WTI Oil has pared gains this morning (-0.4%), after API reported US crude stockpiles fell last week, but increasing gasoline supplies offset this development. Elsewhere, the joint OPEC and non-OPEC committee will meet again in late September to review production curbs. Iron ore dipped 0.4% after a c9% rise over the prior three days. Precious metals were slightly down (Gold -0.5%, Silver -0.1%), while other metals have also softened this morning with copper (-0.1%), aluminium (-0.6%) and zinc (-1.2%). Away from the markets, San Francisco Fed President Williams said there’s no sign of recession near term and that in regards to the Fed’s plan to unwind its balance sheet, he said “we’re trying to make it boring”. 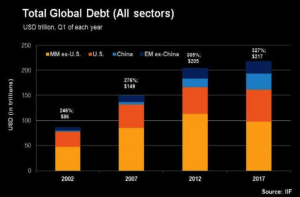 Elsewhere, DB’s Winkler and Harvey have written on the looming US debt ceiling debate. They argue that even if a technical default is highly unlikely, the issue is likely to become an increasing focus for markets and so they examine potential tail risks for the US dollar. On the fiscal side, the main risk concerns are any fiscal conditionality attached to a debt ceiling increase. The experiences of 2011 and 2013 show that debt ceiling debates have the potential to become important fiscal turning points. On the monetary policy side, it would likely be too early for the Fed to take into account developments in Washington at their 20 September meeting. Before we take a look at today’s calendar, we wrap up with other data releases from yesterday. In the US, the Richmond Fed manufacturing index was steady mom but higher than expected at 14 (vs. 10), suggesting a manufacturing ISM reading in the 55-60 range. The FHFA house price index for June was slightly lower at 0.1% (vs. 0.5% expected), lowering the through-year growth to 6.5% yoy. In Germany, the ZEW expectations index was lower than expected at 10 (vs. 15.0), partly impacted by concerns that the rising Euro will weigh on the economy as well as the widening diesel car scandal. Over in the UK, the CBI’s Industrial Trends survey again painted a positive picture, with the output expectations and orders indices both edging higher and thus remaining at historically elevated levels. Elsewhere, the July borrowing data was lower than expected, with public sector net borrowing at -0.8bn (vs. 0.3bn expected) and private sector net borrowing for July at -0.2bn (vs. 1.0bn expected). Looking at the day ahead, the Markit PMIs on manufacturing, services and composite will be out for the US (53.4 expected for manufacturing and 54.9 for services), Eurozone, Germany and France. The Eurozone’s advance consumer confidence for August will also be out. Over in the US, there is the MBA mortgage applications and new home sales data (0% mom expected) for July. Onto other events, Draghi will speak at Lindau (Germany), potentially providing an update on the QE. Over in the US, the Fed’s Kaplan will also speak. Kim Jong Un is once again showing the US exactly how disinterested he is in negotiating any settlement – particularly one that ultimately forces North Korea to surrender its nuclear weapons: To wit, Kim ordered more rockets and warheads during a televised visit to a local munitions factory just hours after Secretary of Defense James Mattis praised Kim’s “restraint” for not having launched any new missile strikes since the latest round of UN sanctions took effect on Aug. 5. Mattis also reiterated that the Trump administration would be open to talks. To be sure, if the “Mad Dog” was looking for signs of a détente from North Korea, he’s bound to be disappointed. Though the date of Kim’s visit to the munitions factory wasn’t disclosed, the North Korean leader could clearly be heard ordering the program to press ahead with its quest to develop a nuclear warhead that could reliably target the Continental US. He also showed off two new additions to his arsenal. As WSJ notes, while Kim’s temporary discontinuation of the missile tests has been perceived as an encouraging sign by some, the real issue is the North’s nuclear program, and any progress their engineers might be making. US intelligence agencies believe the Kim regime possess the capability to reach the US with an ICBM. Photos published by the KCNA along with Wednesday’s report showed Kim inspecting what looked to be two new missiles. “Photos published alongside Wednesday’s report by the official Korean Central News Agency showed Mr. Kim and other officials standing in front of diagrams. Missile experts said the diagrams appeared to show at least two never-before-seen missiles, including one that looked to be a variant of a solid-fueled missile that North Korea launched from a submarine last year. The photos represent a clear message to the US: North Korea has no intention of halting its nuclear weapons program. “’Pyongyang’s release of photos indicating yet two more new missiles in development shows it has no intention of halting its continuing quest to threaten the U.S. and its allies with nuclear weapons,’ said Bruce Klingner, senior research fellow for Northeast Asia at the Heritage Foundation. Another of the WSJ’s “expert” sources said the missile program is probably “untouchable” for now, but that diplomacy could still be worth pursuing. “’The missile-building program is unstinting,’ said Patrick Cronin, senior director of the Asia-Pacific Security Program at the Center for a New American Security. But Mr. Cronin argued that the U.S. should continue to pursue diplomacy with Pyongyang, and encourage any signs of progress — including the recent dearth of missile tests. North Korea hasn’t launched a missile in 26 days, though the launch of its first ICBM on July 4 came after a 35-day pause. In summary, the Pyongyang report was of a kind with what North Korea has said from the beginning: It will not give up its weapons. End of story. Provident Financial. What a mess. Is it an opportunity? Provident has become the story of the week. In case you missed it: the stock has been hammered and its bonds are trading massively down on the back of multiple bad news bullets: an FCA investigation into the Vanquis credit card and loan repayment options, a failed new technology introduction and new staffing approach that caused a leap in defaults from 10% to 43% (! ), suspended dividends and the departure of the CEO. For years Provident was a respected name, secure in its niche supplying credit to the bottom of the UK credit pool. Its experienced independent door-to-door salesmen managed their clients pragmatically – a personal touch that kept defaults low and recoveries high. Earlier this year the model was turned on its head. The independent door-to-door guys were replaced by I-pad wielding scripted staff controlled by head office. The system appears to have collapsed overnight. Defaults soared. The firm threw away control of its clients. Provident has been described as “uninvestable”. It looks like a case of classic management incompetence. Replace a tried and tested functional business model with something new that doesn’t work. But there is more to it. It should remind fixed income investors of the importance of cash-flow – and exactly how cash is collected and overseen. Years of experience has taught us that firms with a tight control of their credit processes and sustainable businesses are the ones to invest in. Apply that test across your credit portfolio. It’s a classic wake up and smell the coffee moment re any secured deal secured or senior debt based around cash flow generative business models. If you wish, apply the same model to High Yield, but make sure there is a defibrillator in the room first. The second lesson is more general – Provident is not the only corporate in more trouble than we thought. This morning WPP is on the wires as tumbling global advertising revenues means a profit warning is merited. Which leads one to wonder what that might mean for firms like Facebook as the younger teen and pre-teen generations abandon the social media site because it’s for their grandparents. Do not ignore the risks generated by trends and society… and just about everything else.. And, the recall the classic adage: invest in companies where you understand the model and are confident the management also understand the risks, the environment and the threats and can deliver. I’m told Provident is secure – although its got a shed-load of debt coming due in coming months through to 2023 (over £1 bln with an average maturity of 2.34 years), the new management is confident it can cover the debt losses, and the likely FCA fine. It’s got bank lines in place to repay £120mm debt due in October. However, the lesson of 2007 was collapsing confidence in a financial’s liquidity is what kills it. Witness Northern Rock – where it wasn’t afflicted by credit losses, but a drying up of liquidity. To recover, Provident will not only have to reverse the current credit losses, but also persuade highly sceptical market it is again investible. That is a 2-3 year process with a new management… not convinced it can happen. Alternatively, perhaps the major shareholders will step in to finance the firm through rehabilitation. As the UK’s best known sub-prime lender spins into a death spiral, what are the implications for mainstream UK banks? The regulators are all over consumer lending like the proverbial cheap suit. There is a risk they will see the opportunity to impose greater hurdles on lending to “persistent debtors”. Bloomberg says 3 million UK credit card holders are in debt trap. Can’t get much worse you’d think.. Oh yes it can. Yesterday, the Trump administration slapped a new round of sanctions on Chinese and Russian entities accused of aiding the North Korean nuclear program. The Treasury Department’s Office of Foreign Assets Control said it would target 10 entities and six individuals who help already sanctioned people to aid North Korea’s missile program, or who “deal in the North Korean energy trade.” Predictably, the Russian and Chinese government’s were less than pleased, with spokespeople for both governments claiming the sanctions are illegitimate because they were not approved by the United Nations. A representative for the Russian government meanwhile promised that a “response” is in the works,” according to Russia Today. Just like China, which immediately slammed the Trump administration, demanding that the “mistake” be fixed asap, the Russian government is just as angry with this latest round of sanctions and, as they have done many times in the recent past, the Russians threatened retaliation. Russian Deputy Foreign Minister Sergey Ryabkov issued a statement expressing disappointment, and warning Washington that Russia was working on a response. While the exact nature of the “inevitable response” has yet to be decided, Ryabkov said he hopes “our American colleagues” will soon understand the “futility” of using sanctions to prod the Russian government, or Russian entities, into cooperation. The companies targeted by the sanctions include Gefest-M, a Moscow-based firm accused of acquiring metals on behalf of a North Korean company, and Mingzheng International Trading, a Chinese and Hong Kong-based bank that allegedly conducted transactions on behalf of North Korea. Andrey Klimov, a senior Russian senator, criticized the sanctions against Gefest-M and the other Russian entities as illegitimate. “We strongly urge the US to immediately correct its mistake, so as not to impact bilateral cooperation on relevant issues,” the spokesperson said, as quoted by the Financial Times. As part of the latest sanctions, the US DOJ filed complaints demanding that two Asian companies forfeit over $11 million for allegedly laundering funds for North Korea. The charge alleges that the two companies violated the international sanctions against North Korea and indirectly supporting its missile and nuclear weapons programs. Proceedings have been launched against Velmur Management Pte Ltd., based in Singapore, as well as the Chinese company Dandong Chengtai Trading Co. Ltd. The Trump administration has aggressively pursued sanctions as a cudgel in its battle to curb North Korea’s nuclear program. As tensions between Kim Jong Un and the US continue to escalate, expect more to come. Trump’s son-in-law and the White House “global peace” adviser, Jared Kushner, arrived in Cairo on Wednesday only to learn that his top-level meeting with Egyptian officials had apparently been cancelled, as Egypt lashed out at the Trump administration’s decision to slash aid to the country. One day after Reuters reports that the US canceled (or at least delayed) nearly $300 million in aid meant for Egypt on the grounds that its strongman ruler Abdel Fattah al-Sisi “hasn’t been respecting human rights and democratic norms” the Egyptian government responded by canceling a meeting between its foreign minister and Trump son-in-law Jared Kushner that was set for today. Kushner is famously responsible for the administration’s dealings in the Middle East. However, President Abdel Fattah al-Sisi’s office said the president would still meet the U.S. delegation, led by Kushner, later in the day as scheduled, according to Reuters. Top Egyptian officials believe the US’ decision to deny the aid package was “insensitive” to the valuable strategic relationship that the two countries have shared for decades. Or, simply stated, Egypt wants the periodic handouts established under the Obama administration to continue. In a statement released Wednesday, just prior to the confusion over Kushner’s meetings with the foreign minister, the Ministry of Foreign Affairs hinted that the significant reduction in aid money from Washington could impact cooperation in many areas, and that withdrawing the aid money lacked “an accurate understanding of the importance of supporting Egypt’s stability. Egypt’s reason for concern is clear: the north African nation is the second largest recipient of military aid from the United States after Israel, receiving about $1.3 billion annually and the officials noted that the U.S. has provided nearly $80 billion in military and economic assistance to Egypt over the past 30 years. They said the U.S. would continue to support Egypt’s efforts to defeat extremists and terrorism as well as the country’s economic development. Egyptian military and law enforcement authorities have battled for months a deadly insurgency by a local ISIS affiliate, along with other jihadist groups, based in the restive Sinai Peninsula. The ISIS group there has carried out many attacks in Egypt, primarily targeting police and religious minorities, including Christians. Cairo was the latest stop on Kushner’s Mideast trip aimed at exploring the possibilities of reviving the long-dormant Palestinian-Israeli peace talks. Kushner’s trip comes in the wake of a July crisis between the Israelis and Palestinians at the site of a major Jerusalem holy shrine after Israel installed metal detectors at its entrance after an attack there killed two Israeli officers. The move incensed the Muslim world, triggering some of the worst Israeli-Palestinian clashes in years. Israel later removed the detectors. Before Egypt, Kushner and the U.S. officials traveled on Tuesday to Jordan, where they met with King Abdullah II, according to the state-run Petra News Agency. The king acknowledged the importance of U.S. involvement and Trump’s commitment to reach a peace agreement between the Israelis and Palestinians, the agency said. That’s how long it took for Canadian Prime Minister and liberal hero Justin Trudeau to realize his promise to welcome all immigrants and refugees to Canada may have been a little short-sighted. After the prime minister proudly proclaimed on Twitter back in January that Canada would welcome all those fleeing “persecution and war,” the prime minister changed his tone this week when he warned refugees crossing into Canada from the US that sneaking into the country illegally wouldn’t fast-track the process of granting asylum. In the months that have passed since Trudeau made his famous promise, the number of refugees streaming over the border into the Canadian province of Quebec surged dramatically, straining local resources available to process their claims of asylum and provide necessities like food and shelter. The asylum seekers are primarily Haitians who fear that the Trump administration might revoke a special protected status implemented after the 2010 earthquake. “If I could directly speak to people seeking asylum, I’d like to remind them there’s no advantage,” Trudeau said at a news conference Sunday in Montreal. Trudeau also stressed that anyone seeking refugee status will have to go through Canada’s “rigorous” screening process. The surge of migrants has overwhelmed both the Canadian legal system and the capabilities of local agencies tasked with aiding refugees. We reportedearlier this month that Canada sent soldiers to a popular crossing site in upstate New York to help build a small encampment for newly arriving refugees. But beads have quickly filled up. According to CBC News, more than 3,800 people walked over the border into the province during the first two weeks of August, compared to the 2,996 who crossed throughout all of July. As CBC notes, Unlike in the United States, Haitians have no special status in Canada, and about half of Haitians seeking refugee status in Canada have already been denied during the past couple of years. Trudeau critic Michelle Rempel said the Canadian government too willingly ignored the brewing refugee crisis on its doorstep, and continues to play down the need to deal with the problem. “Conservative immigration critic Michelle Rempel said Trudeau is downplaying the urgent need to deal with the surge in people crossing the border. Too help alleviate the problem, Rempel says the federal government should increase funding for the IRB, the board that evaluates all asylum claims. Even before the surge at the border, the IRB was hopelessly backlogged, ensuring that claimants could remain in the country in a legal limbo while they waited for their hearing. Allowing the department to process claims more quickly would remove this incentive for asylum seekers to cross illegally. Still, given his professed love for immigration and multiculturalism, we wonder just how far Trudeau will go to stanch the tide of refugees. Will there be more soldiers and more camps? Or will Trudeau hire an army of claims processers to start kicking people out of the country – or at least ensure that those allowed to remain deserve to do so? One thing’s for sure: He’s going to need to do something. WTI crude prices managed to scramble back up to pre-API-tumble levels ahead of DOE’s data dump this morning with all eyes on gasoline inventories, which did not disappoint showing a small draw (in line with expectations) along with crude’s draw which was roughly in line with API and expectations. Production continues to rise to highest since July 2015. One crucial data point that Bloomberg’s Javier Blas notes: total U.S. oil stocks (which includes crude, refined products and the volatile “other oils” category) were unchanged last week. That’s not what the bulls need. Amid all the bluster, we found it ironic that Crude imports from Venezuela climbed 52 percent to 987,000 barrels a day, also the most since April. But its mostly noise as the algos cant decide which way to trend for now. The crude stockpile drop was basically in line with mean estimates. The net draw across the petroleum value chain is a modest positive. However, a drop in refinery utilization foretells ebbing of demand, as driving season comes to an end. The bearish view is reinforced by output above 9.5 million barrels a day and pushing higher, based on management commentary from 2Q earnings calls. Venezuela bonds are tumbling after the WSJ reported that the US government was considering a ban on trading in the country’s debt. PDVSA’s 12.75% 2022s were trading at 44.75 this morning,down from around 45.65 at Tuesday’s close and two points weaker than levels seen earlier in the week, according to MarketAxess. Bond traders also sold PDVSA’s 6% 2026s, which had fallen about a point to 30.00. One option being considered is banning the trading in just some papers issued by the state oil company to limit its access to external funds, said a third person. The ban would be the first step against the Venezuelan financial system since Mr. Trump promised “swift economic action” against Mr. Maduro for installing a parallel parliament staffed with loyalists earlier this month. Then again, Trump may not have to lift a finger to accelerate Venezuela’s default. As reported last week, following the recent sanctions against Maduro’s socialist paradise, foreign banks are shutting out Venezuelan companies and are refusing to provide the country’s oil tankers with the letters of credit they need to offload oil, and replace it for one commodity most needed in Venezuela: hard dollars. As a result, the decline in PDVSA’s (and Venezuela’s) dollar reserves is accelerating with every day, a pace which roughly tracks the recent plungein Venezuela bonds. Not everyone is convinced that Venezuela is facing an imminent default. In a separate report, the WSJ writes that one large holder of Venezuelan debt, Ashmore Group PLC, thinks investors have come to the wrong conclusion. Mr. Maduro’s political power “has just increased dramatically,” said Jan Dehn, head of research at the emerging-market fund, which has $56 billion under management. The July vote, which was widely seen as fraudulent, convened a powerful new assembly aligned with Mr. Maduro that will be able to override other institutions and redraft the constitution. Mr. Maduro’s administration has prioritized paying bondholders, even as the wider economy has shrunk, sparking widespread unrest and food shortages. As long as he retains a tight grip on power, that is unlikely to change, Mr. Dehn believes. According to Dehn, Maduro’s political strength is one of three factors that should mean the country “can continue to service the debt indefinitely.” The other two are that oil remains above $40 a barrel and that state-owned oil company Petróleos de Venezuela SA, PdVSA, retains access to working capital. In thie case, one can imagine why Maduro would do everything in his power to delay default until the bitter end, both for creditors and his administration, which has so far had the support of the army but will promptly lose it once the cash flow tries up. That’s also why many Venezuelan bonds rebounded since the Constitutional Assembly vote. However, if the Journal is correct and the US is about to block trading of Venezuela bonds, that could well be the tipping point that forces creditors to finally give up on the Caracas regime, leading to a prompt default and the fall of Maduro, in the process Washington will once again have succeeded in toppling a foreign regime, this time without firing a single shot. Early WEDNESDAY morning USA 10 year bond yield: 2.2080% !!! UP 0 IN POINTS from TUESDAY night in basis points and it is trading JUST BELOW resistance at 2.27-2.32%. The 30 yr bond yield 2.7816, UP 0 IN BASIS POINTS from TUESDAY night. USA dollar index early WEDNESDAY morning: 93.38 DOWN 17 CENT(S) from TUESDAY’s close. the Italian 10 yr bond yield is trading 55 points HIGHER than Spain. Stocks are rapidly erasing yesterday’s “making strides on taxes” gains as Trump’s government shutdown threats remind investors just how fragile this whole facade is. The ‘risk-off’ trade is evident everywhere with Treasury and Bund yields tumbling, gold up, and USDJPY sliding. As we noted earlier, yesterday, when stocks surged at the market open following Politico’s report that Trump is unexpectedly “making strides” on tax reform, we warned that “it can all be wiped away as soon as tonight, when Trump will deliver a speech to his “base”, in which he may promptly burn any of the goodwill he created with capital markets following his far more conventional Afghanistan speech last night.” That’s precisely what happened, because on Tuesday night, in another fiery campaign rally, Trump fiercely defended his response to violence in Charlottesville, made passing remarks from a teleprompter about the need for unity and inclusion before veering off-script to attack the news media, Democrats and even Republicans in the Senate whom he accused of distorting his response and blocking his agenda. Soft data reporting of USA services soars to highest levels since 2015. However soft data manufacturing slumps. The US Manufacturing economy continues to languish near one-year lows (in line with the collapse in ‘hard data’ in recent months) but US Services are soaring to their highest level since April 2015. Weaker increases in both output and new orders were key factors weighing on the headline manufacturing PMI in the latest survey period. Production volumes expanded at the slowest rate for 14 months in August, while new business growth weakened from July’s four-month high. Consequently, purchasing activity rose at a softer pace while firms also registered slower increases in inventory levels. Latest data signalled a further pick up in the rate of input price inflation at US goods producers. According to anecdotal evidence, strong economic conditions and an improvement in client demand had driven the latest upturn in activity. The latter was highlighted by a sharp and accelerated rise in new business received by services companies, with the rate of new order growth reaching a 25-month high in August. Greater intakes of new work and rising activity levels led firms to hire more staff in August. “The US economic growth story remained a tale of two sectors in August. The overall rate of expansion accelerated to a 27-month record, driven higher by strong and improved growth of business activity in the vast services economy. In contrast, the performance of manufacturing remained sluggish in comparison, with production volumes rising to the weakest extent in over a year. “Nonetheless, the acceleration signaled for the economy as a whole suggests that GDP growth is still gaining momentum during the third quarter. With new order inflows also strengthening and job creation equalling its best pace in the year-to-date, economic growth should remain on course to outperform relative to the second quarter. Is GDP hope driving surveys? The following shows the huge rut the uSA is in with respect to their economy. New home sales plunged by a monstrous 9.9% last month. This follows June’s huge plunge in new household formations as millennials continue to live with their parents. As it appears higher mortgage rates, stagnant wages, and soaring prices have finally caught up to one another. Probably the right time to be hiking rates some more. But that’s nonsense. The reason that home builders can’t find “qualified” labor is because they don’t pay enough to compete with easier alternatives, like being an Uber driver, which can pay nearly double the wages paid to construction workers. I had a ride with a Lyft driver, a family man who moved to Denver from Venezuela, who took a job in construction when he moved here. As soon as he got his driver’s license, he switched to Lyft because it was easier on his body and paid a lot more. If builders raise their wages to compete with alternatives, they’ll be able to find plenty of qualified workers but their profitability will go down the drain unless they raise their selling price, in which case their sales will go down the drain…which is beginning to happen anyway. The real culprit is the record high level of household debt that has accumulated since 2010. The populace has run out of its capacity to take on new debt without going quickly into default on the debt already issued. Mortgage purchase applications are a direct reflection of this. Mortgage purchase applications declined again from the previous week, according to the Mortgage Bankers Association. In fact, mortgage applications have declined 14 out of the last 20 weeks. Please note that this was during a period which is supposed to be the seasonally strongest for new and existing home sales. Furthermore, since the beginning of March, the rate on the 10-yr bond has fallen over 40 basis points, which translates into a falling mortgage rates. Despite the lower cost of financing a home purchase, mortgage purchase applications have been dropping consistently on a weekly basis and at a material rate. 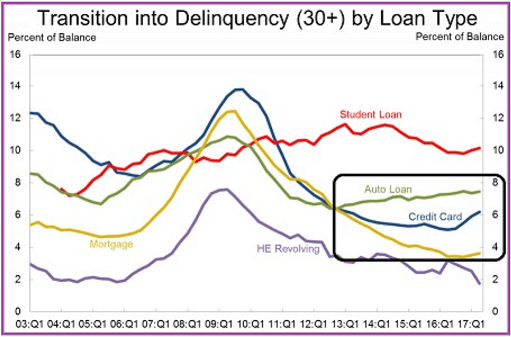 Combined, the percentage of auto, credit card and student loan delinquencies and rate of default is as big or bigger than the subprime mortgage problem that led to the “Big Short.” To compound the problem, the nature of the underlying collateral is entirely different. A home used as collateral has some level of value. Automobiles have collateral value but a shockingly large number of borrowers have taken out loans well in excess of the assessed value of the care at the time of purchase. Unfortunately for auto lenders, used values are in a downward death spiral. Credit card and student loan debt have zero collateral value. If yesterday’s tape bomb came courtesy of the most prominent UK subprime lender, Provident Financial, which plunged over 70% after it gave a “clearly awful” business update coupled with the resignation of its CEO, today’s market shock belongs to ad giant, WPP, whose shares crashed the most since 2000 after the world’s largest advertising company cut full-year revenue forecast amid lower spending by customers, while reporting dreadful Q2 earnings. In a clear warning to ad-dependent tech behemoths such as Google and Facebook, or rather their shareholders, WPP stock plunged as much as 12% after the company again slashed its revenue guidance, which is now expected to be between zero and 1% in 2017. That’s down from an earlier 2% forecast. Just five months ago, in March, WPP, which owns advertising agencies such as Ogilvy & Mather, Grey Global, and JWT, suffered its biggest drop since the financial crisis when it gave its initial forecast for 2% growth, the slowest pace since 2009. Now that number is down to 0%. It wasn’t just the company’s forecast: in the second quarter, WPP’s “like-for-like” net sales fell 0.5% with July declining 2.6% and North America and Western Continental Europe were the poorest performing regions, according to Bloomberg. Worse, constant currency billings plunged 4.7% Y/Y, confirming just how little pricing power even the biggest market players in the field have. Q2 results confirmed unexpectedly weaker industry trends highlighted previously by U.S. competitor Interpublic. The company, which according to analysts laid out dismal earnings and “terrible guidance”, blamed populist politics in the UK and US, fake news on platforms like Facebook and Google, and short-term thinking in business, for the terrible start to the year. WPP also blamed “technological disruption, cheap money, activist investors and zero-based budgeting models, which focus incumbents on short-term profitability and cost control,” for putting companies off advertising and marketing. WPP said this is particularly an issue in the consumer goods sector, which accounts for a third of its revenues. As a result, 2017 has so far been “much tougher” than 2016, which was a record year for the business. In the last year or so, growth has become even more difficult to find, perhaps due to increasing social, political and economic volatility, for example with the rise of populism typified by surprise election results in the United Kingdom and the United States and bumpy growth in three of the bigger BRIC countries of Brazil, Russia and China, although India continues to develop rapidly, despite introductions of demonetisation and a General Sales Tax. Even the growth of the digital marketplace has been dogged by issues such as measurability, viewability, fraud, and fake news, let alone the duopoly of Google and Facebook and the growing dominance of Amazon in so many spheres, including, but not exclusively, ecommerce, retail, cloud computing and content. In a slower growth world, both more recently and post-Lehman, inflation has been negligible, perhaps also suppressed by digital deflation. As a result, clients have markedly less pricing power and finance and procurement departments are very focused on cost. In this world, it is, perhaps, not surprising that clients have reduced spending. It’s not just WPP: advertising companies worldwide have been hit as brand clients like Unilever and Procter & Gamble focus on cost-cutting to cope with sluggish global economic growth and technological disruption. WPP singled out a decline in ad spending on consumer goods – items such as laundry detergent and toothpaste that make up about one-third of its revenue – as coming under particular pressure. As previously reported, Unilever, one of WPP’s biggest customers, said earlier this year that it would cut ad spending by up to 30% and cut the number of creative agencies it works with to 1,500 from 3,000. That followed a failed takeover bid by Kraft-Heinz, which was the “seminal” moment in the first quarter, according to WPP Chief Executive Officer Martin Sorrell. Following the dismal news, WPP comp Publicis dropped 2.9% in Paris, while IPG and Omnicom are set for a lower open in the US. Shares of European television companies including TF1, ProSiebenSat.1 Media SE and ITV Plc declined as well. Meanwhile back to WPP, the company has already seen its shares slide 12% YTD amid “a difficult economic climate and pressure on its businesses in North America.” Today’s plunge has chopped off 20% of its market cap in 2017 while its biggest rivals, including Interpublic Group of Cos., Publicis Groupe SA and Omnicom Group Inc., are each down more than 8% this year. So far, names like Google and FaceBook have remained unscathed but one wonders how long before cost-cutting advertisers slash online spending next. Whether or not it can achieve that depends on both the economy, and what its competitors do. And while we wait to find out, here is a recap of the sellside’s unhappy response to WPP’s numbers, courtesy of BLoomberg. Like me, many of you watched President Trump’s train wreck of a speech on Afghanistan earlier tonight. It’s nearly midnight and I am still reeling. After 16 years – the longest war in US history – no one even remembers what we are fighting for in Afghanistan. Not another American (or innocent Afghan) life for one of the most convoluted and idiotic wars in history! Trump of 2012 and 2013 said just that. Candidate Trump said just that. Then tonight he told us that once you sit in that chair in the Oval Office you see things differently. The market certainly does not like this: bad blood is spilling between Trump and McConnell as their relationship disintegrates. McConnell doubts whether Trump can save the Presidency . According to a new bombshell report from the NYT, the relationship between President Trump and Senate Majority Leader Mitch McConnell has “disintegrated” in recent week “to the point that they have not spoken to each other in weeks”, prompting the Kentucky senator to express doubts if Trump can succeed in office and “salvage the presidency” after a summer of controversies and crises. In a phone call on Aug. 9, Trump blamed McConnell for the Senate’s troubled efforts to repeal and replace the Affordable Care Act. The Times said the call descended into shouting and profanity. During the call, which Mr. Trump initiated on Aug. 9 from his New Jersey golf club, the president accused Mr. McConnell of bungling the health care issue. He was even more animated about what he intimated was the Senate leader’s refusal to protect him from investigations of Russian interference in the 2016 election, according to Republicans briefed on the conversation. Mr. McConnell has fumed over Mr. Trump’s regular threats against fellow Republicans and criticism of Senate rules, and questioned Mr. Trump’s understanding of the presidency in a public speech. Mr. McConnell has made sharper comments in private, describing Mr. Trump as entirely unwilling to learn the basics of governing. While McConnell was reportedly troubled by Trump’s remarks that placed equal blame on hate groups and counterprotesters, that was just the tip of the iceberg of the pent up animosity between the two. The Senator also signaled his unease with Trump’s comments to business leaders who quit their posts on presidential advisory councils in recent days, the NYT reports. But the straw that broke the camel’s back was last month’s failure by the Republican controlled Senate to pass Obamacare repeal, a humiliating defeat for Trump’s main campaign promise. McConnell said in a speech earlier this month that Trump had “excessive expectations” about moving his legislative agenda through Congress. That led Trump to repeatedly lash out at McConnell on Twitter, questioning why McConnell has not been able to accomplish longtime GOP campaign promises. Trump went so far as to suggest to reporters at his Bedminster, N.J. golf club that, if McConnell is unable to pass healthcare reform, tax reform and an infrastructure bill through the Senate, he should consider stepping aside from his leadership role. In offhand remarks, Mr. McConnell has expressed a sense of bewilderment about where Mr. Trump’s presidency may be headed, and has mused about whether Mr. Trump will be in a position to lead the Republican Party into next year’s elections and beyond, according to people who have spoken to him directly. While maintaining a pose of public reserve, Mr. McConnell expressed horror to advisers last week after Mr. Trump’s comments equating white supremacists in Charlottesville, Va., with protesters who rallied against them. Mr. Trump’s most explosive remarks came at a news conference in Manhattan, where he stood beside Ms. Chao. As the NYT adds, McConnell will no longer be silent should Trump use the bully pulpit for future attacks. Instead, McConnell is now fully committed to firing back at Trump, and protecting his GOP senators. It’s not just the Senate majority leader: McConnell allies like former Sen. Judd Gregg of New Hampshire and former Republican National Committee finance chair Al Hoffman are quoted as well, making ominous predictions about Trump. “Failure to do things like keeping the government open and passing a tax bill is the functional equivalent of playing Russian roulette with all the chambers loaded,” Gregg said of Trump, blaming him for in the Times’ words “undermining” congressional leaders, adding that if Trump “can’t participate constructively” the House and Senate would take matters into their own hands. Whatever Trump’s kneejerk reaction following the conclusion of tonight’s Phoenix rally, the biggest loser may be the market which today surged on a Politico report that Trump’s tax reform suddenly looks like it has a chance of passing. If the NYT report confirms one thing, it is that when it comes to Trump’s legislative agenda, any chance of success in the through the Senate is virtually nil. Very strange: former USA Attorney states that there is something every odd in the indictment on the Awan. We’ve written frequently over the past couple of months about the litany of unanswered questions surrounding the mysterious case of Debbie Wasserman Schultz’s (DWS) IT staffers. Why did DWS seeminglythreaten the chief of the U.S. Capitol Police with “consequences” for holding equipment that was confiscated as part of an ongoing legal investigation? Why did DWS keep Awan on her taxpayer funded payroll all the way up until the day he was arrested by the FBI at Dulles airport while trying to flee the country to Pakistan? What, if anything, does the Awan family know about the DNC hacks that may have caused DWS to act in this way? Now, Andrew McCarthy III, the former assistant U.S. attorney for the Southern District of New York who led the prosecution against Sheikh Omar Abdel Rahman and eleven others for the 1993 World Trade Center bombing, says there is “something very strange” about the recent indictment filed against Imran Awan and his wife Hina Alvi in the District of Columbia. In a National Review article, McCarthy points out that it’s not what’s in the indictment that is necessarily surprising but rather what is seemingly intentionally omitted. For instance, McCarthy points out that“the indictment appears to go out of its way not to mention” that Imran was apprehended while in the process of fleeing the country,a fact that would seem to be the best evidence available to prove the fraud charges. Then there is the case of Imran’s wife, Hina Alvi. When she fled the country back in March she was detained by U.S. Customs and Border Protection agents with over $12,000 cash in her luggage, technically a crime by itself if not properly disclosed, but was allowed by the FBI to leave the country despite having been under investigation for months. And then there is just the continued secrecy surrounding the case. Why did the U.S. Attorney’s office decide against filing a press release in a case that has garnered significant national attention? Why was the case filed in a district where DWS’s brother has been an assistant U.S. attorney for many years? However, as of this morning, it’s not just the debt ceiling that traders have to worry about, because as discussed overnight, a new potential problem emerged last night when Trump told a Phoenix rally that he is commited to securing funds for a border wall, even if it results in a government shutdown. While last night’s rally audience loved the threat, Democrats promptly blasted it: on Wednesday, Chuck Schumer ripped Trump for threatening to shutdown the government: “If the President pursues this path, against the wishes of both Republicans and Democrats, as well as the majority of the American people, he will be heading towards a government shutdown which nobody will like and which won’t accomplish anything,” Schumer said on Wednesday. Including funding for a physical wall is considered a non-starter for Democrats, whose votes will be needed to get a government funding bill through the Senate. In summary, while Compass Point says that lawmakers will promptly raise the debt ceiling in mid-September, or less than a month from now – something which Morgan Stanley and others find hard to believe – a government shutdown in October suddenly all too likely. Then, shortly after the note was released, rating agency Fitch also chimed in and warned that if the U.S. debt limit is not raised in a timely manner, it would review the U.S. sovereign rating, with potentially negative implications. In other words, Fitch is warning that a repeat of August 2011 – when S&P infamously downgraded the US to AA+ after the failure to raise the debt ceiling resulted in a brief technica default0 is now on the table. The silver lining: Fitch said that a government shutdown following a debt ceiling increase, such as the one envisioned by Compass Point, would not direct affect on U.S. AAA rating. Finally, for those who are still on the fence about the likelihood of a shutdown and are otherwise unhedged, one month ago Bank of America put together a “costless” spread collar trade, should volatility surge in the coming weeks as a debt ceiling/government funding deal emerges as unlikely. Here again is how to make money should the US government shut down in just over a month. We are comfortable selling VIX puts to leverage a likely floor in volatility, particularly ahead of the debt ceiling, and using the premium collected to the cheapen the cost of portfolio protection. For example, investors may consider selling the VIX Oct 12 put vs. the 14/19 call spread, indicatively zero-cost upfront with a net delta of +54 (Oct fut ref 13.35). The trade leverages the facts that (i) VIX 3M ATMf implied volatility, while low, is not necessarily cheap compared to the level of the VIX 3M future (Chart 14), and (ii) VIX 3M call skew is currently very steep, in the 92nd percentile since Sep-09 (Chart 15). More critically, while VIX call spread collars have been challenged by recent sub-11 VIX settlement values, they can be successful, low-cost hedges when there are defined macro catalysts on the calendar to provide support to volatility, as seen from the US election and more recently the first round of the French election. Lastly, we are comfortable capping upside via the call spread as the VIX 1M and 2M futures have not closed above 20 since Brexit over one year ago. Chris Whalen is one of the analysts who saw the housing crisis in 2008. He is one smart cookie. Today he describes the uSA housing scene as:”Winter is here” as buyers are just thinning out due to lack of income. After several weeks on the road talking to mortgage professionals and business owners, below is an update on the world of housing finance. We hope to see all of the readers of The Institutional Risk Analyst in the mortgage business at the Americatalyst event in Austin, TX, next month. The big picture on housing reflected in the mainstream media is one of caution, as illustrated in The Wall Street Journal. Borodovsky & Ramkumar ask the obvious question: Are US homes overvalued? Short answer: Yes. Send your cards and letters to Janet Yellen c/o the Federal Open Market Committee in Washington. But the operating environment in the mortgage finance sector continues to be challenging to put it mildly. As we’ve discussed in several forums over the past few years, home valuations are one of the clearest indicators of inflation in the US economy. While members of the tenured world of economics somehow rationalize understating or ignoring the fact of double digit increases in home prices along the country’s affluent periphery, sure looks like asset price inflation to us. In fact, since WWII home prices in the US have gone up four times the official inflation rate. Inflation, just to review, is defined as too many dollars chasing too few goods, in this case bona fide investment opportunities. A combination of slow household formation and low levels of new home construction are seen as the proximate cause of the housing price squeeze, but higher prices also limit the level of existing home sales. Many long-time residents of high priced markets like CA and NY cannot move without leaving the community entirely. So they get a home equity line or reverse mortgage, and shelter in place, thereby reducing the stock of available homes. Two key indicators that especially worry us in the world of credit is the falling cost of defaults and the widening gap between asset pricing and cash flow. Credit metrics for bank-owned single-family and multifamily loans are showing very low default rates. More, loss-given default (LGD) remains in negative territory for the latter, suggesting a steady supply of greater fools ready to buy busted multifamily property developments above par value. We can’t wait for the FDIC quarterly data for Q2 2017 to be released later today as we expect these credit metrics to skew even further. Single-family exposures are likewise showing very low default rates and LGDs at 30-year lows, again suggesting a significant asset price bubble in 1-4 family homes. The fact that many of these properties are well under water in terms of what the property could fetch as a rental also seasons our view that we are in the midst of a Fed-induced investment mania. One of the interesting facts about the mortgage sector in 2017 is that even though average prices have more than recovered from the 2008 financial crisis, much of the housing stock away from the desirable periphery has not really bounced. This is yet another reason why existing home sales at a bit over a million properties annually have gone sideways for months. The 600,000 or so new housing starts is half of the peak levels in 2005, but today’s level may actually be sustainable. We had the opportunity to hear from our friend Marina Walsh of the Mortgage Bankers Association at the Fay Servicing round table in Chicago last week. Mortgage applications have been running ahead of last year’s levels, yet overall volumes are declining because of the sharp drop in refinancing volumes. We disagree with the MBA about the direction of benchmarks such as the 10-year Treasury bond. They see 3.5% yields by next year, but we’re still liking the bull trade. But even a yield below 2% will not breath significant life into the refi market. Though prices in the residential home market remain positively frothy in coastal markets, profitability in the mortgage finance sector continues to drag. Large banks earned a whole 15 basis points on mortgage origination in the most recent MBA data, while non-banks and smaller depositories fared much better at around 60-70bps. But few players are really making money. During our conversations over the past several weeks, we confirmed that the whole residential housing finance industry is suffering through some of the worst economic performance since the peak levels of 2012. The silent crisis in non-bank finance we described last year continues and, indeed, has intensified as origination margins have been squeezed by the market’s post-election gyrations. Looking at the MBA data, if you subtract the effects of mortgage servicing rights (MSR) from pre-tax income, most of the industry is operating at a significant loss. The big driver of the industry’s woes is regulation, both as a result of the creation of the Consumer Finance Protection Bureau and the actions of the states. Regulation has pushed the dollar cost of servicing a loan up four fold since 2008. From less that $100 per loan in 2008, today the full-loaded cost of servicing is now $250, according to the MBA. The cost of servicing performing loans is $163 vs over $2,000 for non-performing loans. As one colleague noted at the California Mortgage Banker’s technology conference in San Diego, “every loan is a different problem.” But nobody in the regulatory community seems to be concerned by the fact that the cost of servicing loans has quadrupled over the past eight years. The elephant in the room is compliance costs, which accounts for 20% of the budget for most mortgage lending operations. Driven by the atmosphere of terror created by the CFPB, the trend in the mortgage industry is to automate the underwriting and servicing process, and make sure that all information used is documented and easily retrieved. The better-run mortgage companies in the US use common technology platforms to ensure a compliant process, but leave the compassion and empathy to humans. By using computers to embed the rules into a business process that is compliant, big steps are being made in terms of efficiency. Trouble is, this year many mortgage lenders are seeing income levels that are half of that four and five years ago. Cost cutting can only go so far to addressing the enormous expense inflation resulting from excessive regulation and revenue compression due to volatility in the bond market. All of this costs time and money, and then more money. Our key takeaway from a number of firms The IRA spoke with over the past three weeks is that response time for meeting the needs of consumers and regulators is another paramount concern. So in addition to the FOMC, banks and mortgage companies can also thank the CFPB and aspiring governors in the various states for inflating their operating costs for mortgage lending and servicing by an order of magnitude since the financial crisis. This is all done in the name helping consumers, you understand, but at the end of the day it is consumers who pay for the inflation of living costs like housing. Investors and consumers pay the cost of regulation. Over the past decade since the financial crisis, the chief accomplishment of Congress and regulators has been to raise the cost of buying or renting a home, while decreasing the profitability of firms engaged in any part of housing finance. We continue to wonder whether certain large legacy servicing platforms — Walter Investment Management (NYSE:WAC) comes to mind — will make it to year-end, but then we said that last year. Like the army of the dead in the popular HBO series “Game of Thrones,”the legacy portion of the mortgage servicing industry somehow continues to limp along despite hostile regulators and unforgiving markets. Profits are failing, equity returns are negative and there is no respite in sight. Even once CFPB chief Richard Cordray picks up his carpet bag and scuttles off to Ohio for a rumored gubernatorial run, business conditions are unlikely to improve in the world of mortgage finance. Winter is here.